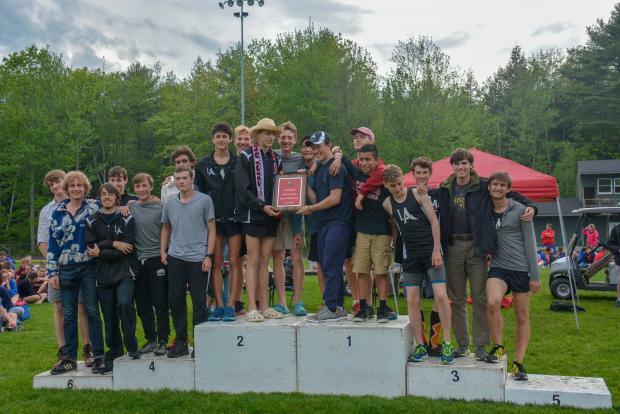 In the last meet held at Mt Ararat High School's current track, the Lincoln Academy Boys team put together 91 points to claim the KVAC Class B. Boys title. As the beginnings of site-work at one end of the field made obvious, things will be changing on the site. Mt. Ararat will construct a new high school on the site of the current track and playing fields beginning this summer. Once that construction is complete the track and athletic fields will be relocated. For the time being Mt Ararat will be without a track. Runners-up last season to Winslow, the Eagles took the title by dominating the distance events, putting up a strong showing in the horizontal jumps, and in the race-walk, and placing in the 300 hurdles. But the Eagles won the meet while taking just two individual titles as junior Sam Russ stood at the top of the podium after both the 1600 (4:40.95) and 3200 (10:21.07). Likewise this year's runner-up, the Cony Rams made it a true team effort. The Rams also topped the podium twice but as the result of relay victories in the 4 x 4 and 4 x 8. The Rams, in their first year in Class B after a lengthy sojourn in Class A, collected 83 points without a single individual title. By contrast the defending champion Black Raiders of Winslow claimed six individual titles. Max Spaulding took firsts in the 110 meter hurdles (16.22), the 300 (41.95) meter hurdles, the 200 (23.37), and the 400. A sophomore and reigning indoor State Champion at 400 meters, Spaulding established a new personal best in the 400 at 50.90. Spaulding has crossed the line first in every race he's run this spring and has also put up triple jump marks that qualify him for the state meet. Senior Jake Warn also claimed two titles as the won the 100 (11.56) and the triple jump (43-01.50); Warn also placed second in the 200. In addition to winning the 1600 and 3200, Sam Russ took fifth in the 800 and had near constant company from teammate Jarrett Gulden who took second in the 1600 and thirds in both the 3200 and the 800. With Jojo Martin and Benji Pugh also scoring in the 3200 the Eagles's strong second place finish in the 4 x 800 was no surprise. 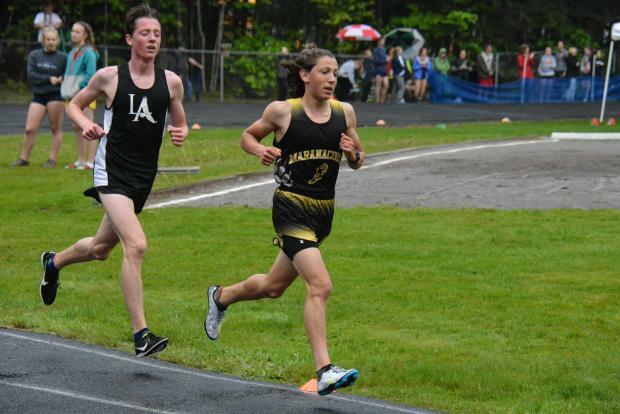 But Russ had a push in the 3200 as Maranacook's Carter McPhedran challenged Theo whole race finishing at 10:26.29, a new personal best to bookended a PR in the 1600 that netted him a fourth place finish. Lauren Pusey-Nazzaro had a great day for Lincoln Academy putting up new personal marks in the long (19-06.5) and triple jumps (41-09.25) on the way to third and second place finishes in the two events. In addition, the Eagles got points from Caleb Armstrong, who placed in both the 100 and 200, Tommy Thelander who ran fourth in the 300MH, and John Eddyblouin and Sam True who took third and fourth in the 1600 meter race-walk. Neither Cony, nor Winslow entered athletes in the race-walk. 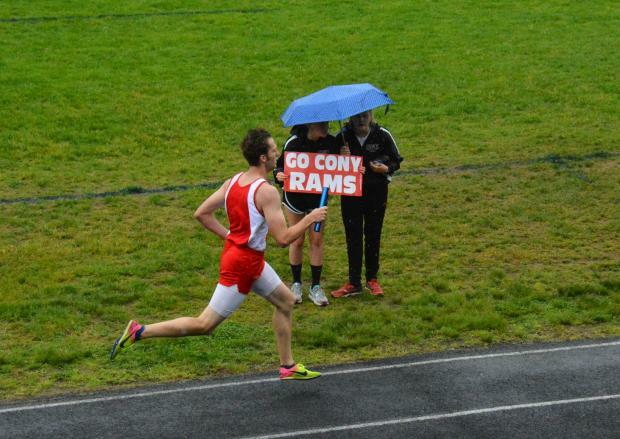 While the champions from Lincoln Academy have a solid 4 x 8 squad, the Cony Rams have a very fast and talented pair of relay teams. Although they won today's 4 x 8 at 8:27.52, the Rams ran an 8:15.01 last weekend, the fastest time in the state so far this season. Expect the 4 x 400 team to be angling for a top spot in the state meet next weekend too. The Rams depth at 400 is obvious as James Olivier, Travis Nickerson, and Alex Cousins took second, third, and fifth in the 400. Olivier also managed a pair of second place finishes in the 110 hurdles, and the 300 hurdles. 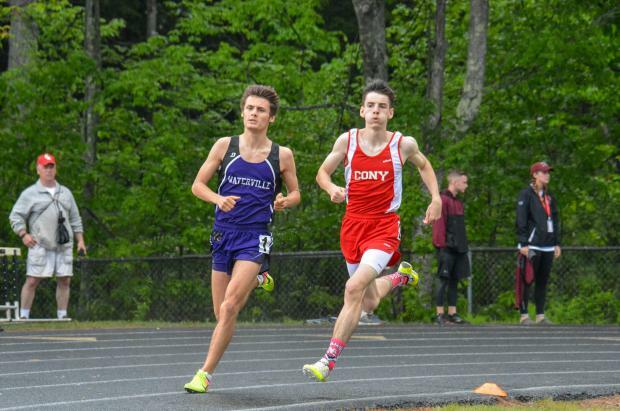 Meanwhile Nickerson ran a very fast back-and-forth 800 with Waterville's Nick Dall before Dall eventual claimed the victory at 1:58.26 to Nickerson's 1:59.61. Both marks were new personal bests. Two more from Cony-Jack Wroten and Caleb Richardson-placed in the 800. Richardson also placed in the 1600, while Wroten scored in the javelin. Nathan Berry joined Olivier on the podium twice placing fifth in the 110 MH and 6th in the 300. Berry also finished fourth in the discus. Elijah Dutil had the second best high jump in Class B to round out the Cony scoring. Connor McGuire of Gardiner had the best high jump as he cleared 6-0 to claim the KVAC title for 2018. Nokomis's Tyler Pelletier matched Belfast's Jack Hansen for top honors in the long jump at 20-03.75. The Pole Vault went to William Green of Maranacook (12-0). Meanwhile Chris Carroll from Oceanside got by Morse's William Carrolton to win the discus (135-7). Carrolton took the shot put with a heave of 41-04.75. Erskine Academy's Jack Jowett pitched the javelin 151-08 for top honors there. Enrico Echevarria claimed the win in the race walk striding to victory in 8:13.87. 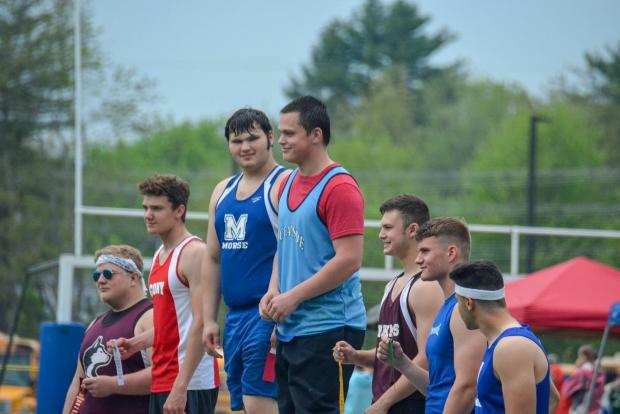 Carrolton's performance in the shot put and discus earned him the Don Matheson Award as the outstanding field performer among the Class B boys.